Tour Times: 7:00am and 1:00pm. Adult Fare: $85 USD per person. Minimun 2 people. Child Fare 10 years old: $60 USD per person. Take a guided tour of the misty Santa Elena Cloud Forest Reserve, a lesser known cloud forest in the Monteverde area. You will walk along different trails in search of birds and mammals, discussing the amazing diversity of plants and learning all about this bio-diverse paradise. The community of Santa Elena borders the Monteverde Conservation area in the Tilaran Mountain Range. Within this region of pristine cloud forest, 310 hectares (765 acres) have been permanently leased by the administration of the Santa Elena community High School. The original vision was to use this land for agricultural research and education in Monteverde. For a variety of reasons, however, the farming proved to be unsuccessful. 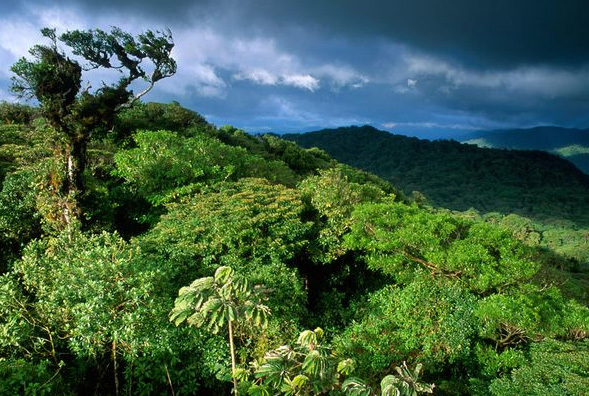 In 1989, it was decided to convert the land into a cloud forest reserve. Together with Youth Challenge International, a Canadian based non-profit organization, the community established an eco-tourism reserve, which officially opened on March 1, 1992. The reserve was created out of a community’s determination to help preserve the unique cloud forest surrounding them and to use tourism as a tool to benefit community development in Monteverde. Entrance fees are used for the protection and management of the reserve as well as to provide higher quality education for the schools in Monteverde. The Santa Elena Cloud Forest Reserve is one of the first community administered reserves in the country (not a national park, but is under the protection of the Arenal Conservation Area). It is an excellent example of what people can do to preserve and learn from their local environment. The tour is essentially a natural history walk in which you will learn about the incredible diverse flora and fauna and many of the unique relationships many cloud forest species have with each other. This walk normally takes about 3 hours. The tour starts at the entrance of the park. Guides are equipped with a spotting telescope as well as binoculars and informational guidebooks. Be sure to bring your camera because you can take pictures through the scope.